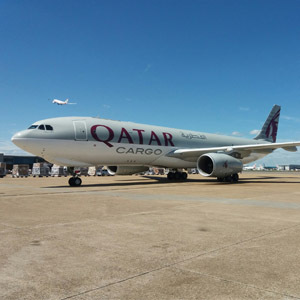 DOHA, Qatar, 2017-Jun-06 — /Travel PR News/ — A Qatar Airways Cargo Airbus A330 freighter touched down at London’s Heathrow Airport yesterday (03 June 2017), marking the start of freighter services to the carrier’s second airport in London. Qatar Airways Cargo currently operates freighters to London’s Stansted Airport and also transports cargo on passenger flights to and from Birmingham, Edinburgh, London Heathrow and Manchester. With the new freighter service, the carrier’s total cargo capacity out of the United Kingdom increases to more than 1,500 tonnes each week. The new freighter service departs weekly from Doha on Saturdays and returns via Basel. The cargo carrier offers air freight services to the principal industries in the United Kingdom, including electronics and telecoms, vehicles and auto parts, engineering, information technology, pharmaceuticals, biotech and health, and perishables, providing speed of delivery, flexibility and security for high-value products. Customers globally will benefit from more capacity to transport their cargo to London. Qatar Airways Cargo recently commenced five new freighter destinations to the Americas and Asia: Buenos Aires, Sao Paulo, Quito, Miami and Phnom Penh, while also increasing frequencies to Brussels, Basel and Hong Kong in response to growing air freight demand in these regions. The cargo carrier has seen a 21 per cent increase in tonnage from 2015 to 2016, despite the air cargo industry remaining competitive due to an underperforming economy. In February this year, Qatar Airways Cargo was awarded the highly-acclaimed ‘Global Cargo Airline of the Year’ award at the Air Cargo Africa event, recognising its continuous growth and emphasis on delivering the highest level of service within the air cargo industry. The carrier has made significant investments in fleet, network, and its hub and products, as part of its strategy and commitment to improve and enhance its product offering for the benefit of customers globally. This entry was posted in Airlines, Airports, Transportation, Travel, Travel Management, Travel Services, Travelers and tagged Freighter Service, London’s Heathrow airport, Qatar Airways Cargo, Ulrich Ogiermann. Bookmark the permalink.